Finding an affordable place to live is a problem in many places throughout the United States—including right here in Charles County. According to the American Planning Association, “Many households in Charles County are struggling with housing costs.” In a report published in May this year, the organization went on to say that forty-seven percent of all households in the county bear a housing cost burden, some of them severely. 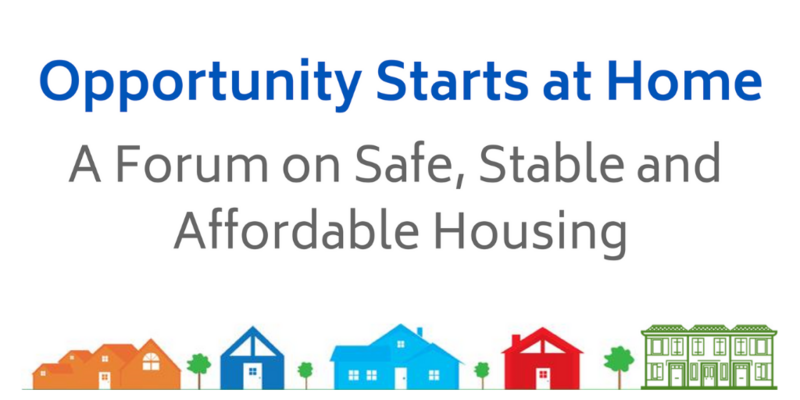 As a means to bring the community together to share ideas about this problem, the Charles County Charitable Trust will sponsor a public forum on Thursday, December 6, 2018 under the title “Opportunity Starts at Home: Safe, Stable and Affordable Housing.” To be held at the College of Southern Maryland, 8730 Mitchell Road, Business & Industry Building Meeting Room 113, La Plata, MD 20646, the event is scheduled for 11:00 am to 4:30 pm (lunch provided), and will highlight a keynote presentation by Trudy McFall, co-founder and president of Homes for America and former president of the Maryland Affordable Housing Coalition. After lunch, the program will turn to a panel discussion moderated by Mark Gaskill, pastor of the Good Samaritan Presbyterian Church in Waldorf. Chosen for diversity of backgrounds, the panel will include Reuben Collins, newly elected president of the Board of County Commissioners; Jerry Lenhart, founder of the Lenhart Development Corporation in White Plains; Sandy Washington, executive director of LifeStyles of Maryland, a nonprofit serving low-income residents; and Stephanie Prange Proestel, deputy director of Housing Initiative Partnership, a green nonprofit housing developer. Sandy McGraw, the Trust’s president, paid tribute to the Charles County Service and Advocacy Network for its key role in planning the forum. She said that the Network was formed three years ago to provide a means for social service and faith-based organizations to discuss evolving needs for health and human services within the county. By mutual agreement earlier this year, the Network became an integral part of the Trust’s overall program of nonprofit assistance. The Trust’s executive director Vivian Mills added that the forum is meant to facilitate constructive dialogue about affordable housing needs and to engender collaborative effort to find solutions. Pre-registration for the forum is being handled online by going to http://bit.ly/2qaBTCq. The fee is $15 and covers lunch. Additional information is available from the Trust at 301-934-3700 or info@charlesnonprofits.org. Other programs carried out by the Trust include management of the Nonprofit Grant Awards Program, which every year distributes funds provided by County government, and a Presidents’ Council, which gives elected leaders of local nonprofits a platform for sharing ideas and information. In addition, the organization has laid groundwork for the launching of a Pro Bono Services Program and for an innovative three-month fundraising clinic for local nonprofits, to start in early 2019 in partnership with Maryland Nonprofits. The Trust, incorporated in Maryland, is a 501(c)(3) nonprofit charitable organization with an office in La Plata. Its mission is to strengthen the community by strengthening the work of the nonprofit organizations serving the community.